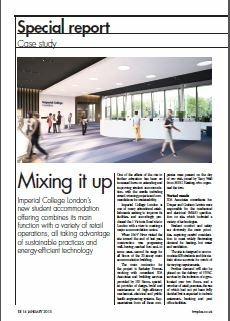 Energy efficient technologies at new student accommodation at Imperial College London include a number of products from MHG Heating. As reported in H&V News (14th January 2015), the building services for the site at 1 Victoria Street were designed by consulting engineers JDA Associates and installed by HE Simm. Energy efficient technologies include combined heat and power (CHP), working in conjunction with a 6,000 litre thermal store manufactured by MHG Heating. The CHP is supplemented by three MHG MCS 1,200kW gas fired condensing boilers which are separated from the CHP unit by 900kW plate heat exchanger, also supplied by MHG. Other products from MHG included two 2,500 litre hot water buffer tanks, two 600kW package plate hot water generators, an electronic system pressure manager and an 800 litre expansion vessel for the primary side of the heating system. Read the full H&V News article.